How to Fix iPhone Stuck in DFU Mode? Solved! Getting stuck into DFU mode is a very common problem for iPhone users as they have to put their iOS iPhone in DFU mode while updating it to iOS 12/11 or jailbreaking them. 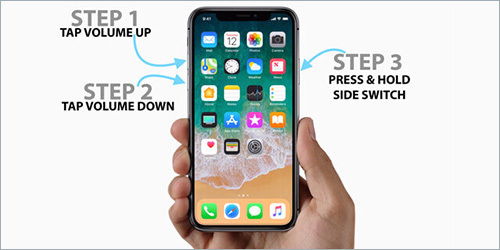 Before discussing the methods to fix iPhone stuck in DFU mode, let us have brief information about what DFU mode is and how your iPhone gets stuck into it. Part 1. What Is DFU Mode? Part 2. Why Your iPhone Get Stuck into It? Part 3. How to Get iPhone out of DFU Mode? Do you know that an iPhone can be restored in three different ways? These three methods include standard restoration with iTunes, restoration in recovery mode and restoration in DFU mode for safer restoration. In this way, DFU or Device Firmware Update mode is used for deepest restoration of your mobile phone because it has potential to restore the problem on permanent basis. Apple has not revealed the secret of this restoration mode for long. Your iPhone can get stuck into DFU mode unintentionally for various reasons and this can be concluded as software issue or hardware problem. Certain kind of software problem can also be the root cause of DFU mode sticking including some glitch in the software, jailbreaking the device, updating software, etc. If you have mishandled your device then there can be hardware problem. It can be due to getting wet, dropped it or annoying the hardware somehow or the other, which may stick your iPhone in DFU mode. So, if your iPhone is jammed in DFU mode then it is the time to know how to get out of DFU mode iPhone. You can ensure the exit DFU mode iPhone just by following the tips provided here under. For iPhone 6 and former, simultaneously holding down the Wake or Sleep button along with Home button for few seconds say 10 seconds. It will restart your device and logo of Apple will appear on your screen. For iPhone 7 (Plus), simultaneously hold down the Power and Volume Down button until you see the Apple logo on the screen. For iPhone 8, X and later, quick press and release Volume Up button and then quick press and release Volume Down button. Keep holding the Power button till the Apple logo appears. At first, to start this process you will have to install the newest version of iTunes on your computer and attach your iPhone to it. iTunes will prompt you to restore your iPhone by telling you about the start of its recovery mode. 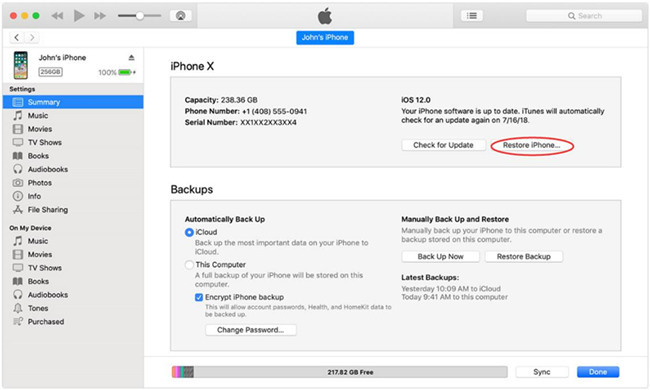 You can start restoring your iPhone with the help of iTunes just by pressing OK and confirm your action by pressing the "Restore iPhone" button. If your iPhone stuck in DFU mode black screen then you can fix it quickly without losing data just by using software for the recovery of iOS system. Normally Joyoshare UltFix iOS System Recovery is one of the professionals for this purpose. 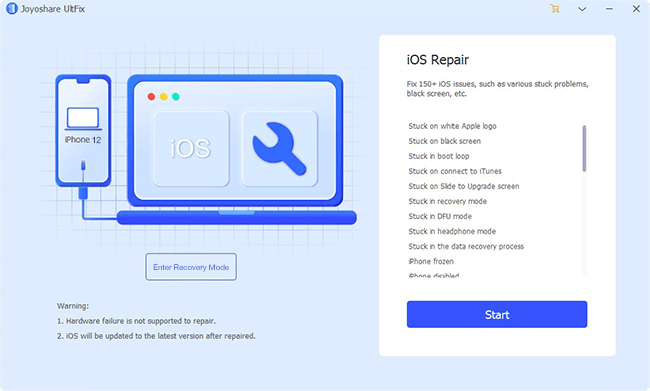 Along with fixing the iPhone stuck in DFU mode won't restore issue, such kind of software can also resolve the issues of stuck in recovery mode, white screen and iPhone reboot loops etc. without any data loss. Using Joyoshare UltFix software to fix your iPhone stuck in DFU mode problem only needs a few steps. Step 2. Choose a recovery mode such as "Standard Mode" to repair iPhone stuck in DFU mode without data loss. Afterward, press on "Next" button and go forward to set iPhone into the recovery mode or DFU mode as instructed. Step 3. It will prompt you to select a firmware suitable for iOS devices to download. You can fix your iPhone trapped in DFU Mode by initiating the process after completing the download. Step 4. The software may take a few minutes to repair your iPhone. You will get your iPhone in original condition after completing the process. If you are unable to restore you iPhone trapped in DFU mode by using any of the above tips then there can be some problem in its hardware. So, it is better to find an authorized service provider of Apple or bring it to an Apple store to fix the problem. You should have Apple ID password ready along with all the accessories provided with it while taking your device to Apple Store to restore it when caught in DFU mode. So, these are all tips for fixing iPhone stuck in DFU mode issue. Try them one by one until your problem is solved. One point you need to pay attention is that, you may lost your important data when your iPhone is jammed in this DFU mode. So, we suggest you to back up your data periodically, so that you have more chance to bring lost data back from backup files. If you forget to sync the data, you can try Joyoshare iPhone Data Recovery to recover lost data, but it cannot guarantee a 100% success rate.